From George Pal's Americanized film version of H.G. Wells' The War of the Worlds comes this 1:48 scale model kit of the Martians War Machine. SPECIAL OFFER - Save £5.00! Diorama model kit recreating the classic scene from the movie, The War of the Worlds. Comes with two Martian War Machines, 2 Sherman tanks, desert style diorama base and death ray parts. Does not come with plated finished parts. Lenses and death ray parts are cast in clear plastic, not coloured. Made using the same computer model used for the 1/48 scale models. Straight from the blockbuster 2005 movie “War of The Worlds” comes this incredible alien tripod model kit! It’s menacing three leg design and unstoppable attacks make this walking war machine one of the most memorable sci-fi designs ever to appear on film. The kit consists of one alien tripod with deployed arm lasers, tentacles and collection cages for building alternate versions. With over 90 pieces, this highly detailed studio accurate model has been created from the original 3d computer model used in the movie. Includes detailed display base and clear eye lenses for possible lighting opportunities. B.C.I. resin kit "Martians War Machine" from the original The War of the Worlds novel. The scale is approximately 1/35 judging by the size of the Martian beastie included in the kit. Kit is moulded in tan and dark grey resin. It builds up into an awesome diorama or stand alone display. 1:8th scale. IP. 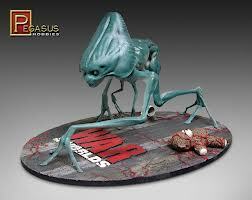 Model of the Martian alien creature as seen in the 2005 movie version of 'The War Of The Worlds'.